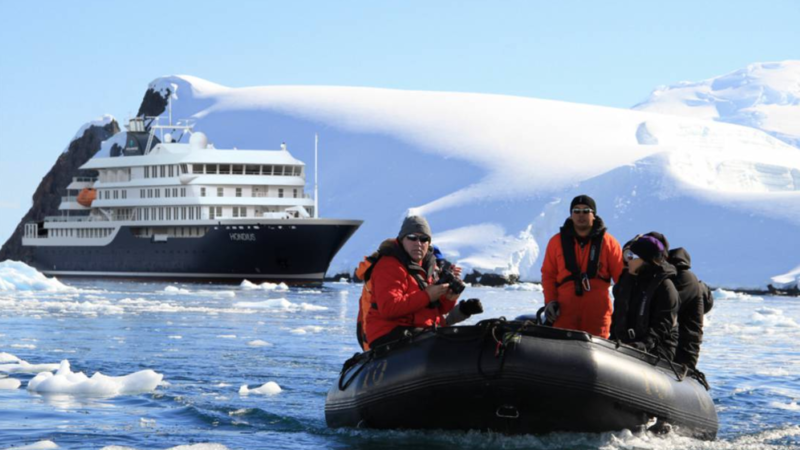 Our small-group expedition vessels in the Arctic allow passengers to enjoy the natural wildlife and scenery of some of the world’s most spectacular and pristine shorelines, above and below the oceans. The vessels have inflatable Zodiacs ready in no time for cruises among ice-floes and local wildlife. A friendly and experienced expedition crew will be anxious to share their enthusiasm and knowledge with their guests. The reliable ice-strengthened vessels, completely rebuilt and renovated, allow us to navigate safely through pack-ice and occasional remote narrow waterways. With only 12 passengers, these traditional wooden Icelandic fishing boats have been carefully restored and adapted to a new role, visiting the Arctic, without compromising their original character. Schooner Opal: Built at the Bodenwerft in Damgarten, Germany in 1951, she served as a trawler in the Baltic and North Sea and in the Barents Sea. In 1973 new owners started her restoration. During 8 years until 1981, Opal was converted to the elegant but seaworthy, two masted schooner she is today. She has sailed all over the world, completing several trans-Atlantic crossings, being carefully maintained through the years. She has undergone restoration and had interior work done to better fit her for the new purpose as an expedition ship. The Opal has six double/twin cabins plus crew facilities. She has three bathrooms, two showers. She comfortably fits 12 passengers, plus her crew. Her sister schooners, Hildur & Donna Woods offer similar facilities. M/V Plancius was built in 1976 as an oceanographic research vessel for the Royal Dutch Navy, and sailed for the Navy until 2004. She was completely rebuilt as a passenger vessel in 2009. M/V Plancius accommodates 114 passengers in 53 passenger cabins with private toilet and shower. 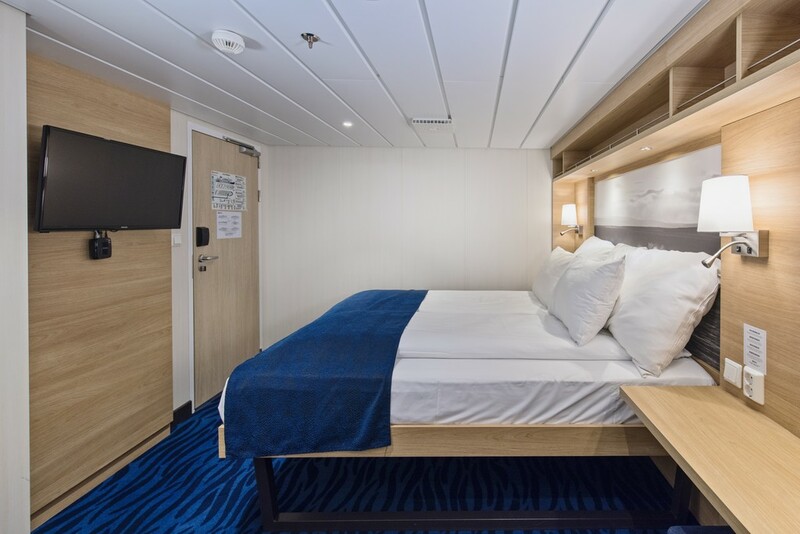 All cabins offer comfortable lower berths (except for the 4 quadruple cabins). The vessel has a restaurant/lecture room, a spacious observation lounge (with bar), large open deck space (with full walk-around possibilities), and is equipped with 10 zodiacs for off ship and shore excursions. M/V Plancius was built for ice conditions, and has a strengthened bow and stern. Click here to view deck plan for MV Plancius. M/V Ortelius has the highest ice-class notation (UL1 equivalent to 1A) and is therefore very suitable to navigate in solid one-year sea ice and loose multi-year pack ice. “Ortelius” is a great expedition vessel for 116 passengers with lots of open-deck spaces and a very large bridge which is accessible to the passengers. The vessel is manned by 34 highly experienced Russian nautical crew, 15 international catering staff, including stewardesses, 6 expedition staff (1 expedition leader and 5 guides/lecturers) and 1 doctor. It has had a major operation in May 2014 with rooms upgraded, safety maintainance and numerous new facilities installed. Click here to view deck plan for MV Ortelius. A sizable observation lounge, fully provisioned bar, and separate library room guarantee that what time you spend on board will be spent comfortably entertained. There is a sheltered zodiac boarding zone for easier entry into the boats taking you on shore excurions. MV Hondius is 350 feet of ice-strengthened Polar Class 6 technology impeccably fortified to the latest standards of the International Maritime Organization. Hondius offers high-quality accommodation for 174 passengers in one spacious suite (35 square meters, 377 square feet), six grand suites with balconies (27 square meters, 291 square feet), eight junior suites (19 to 20 square meters, 205 to 215 square feet), eight superior cabins (20 to 21 square meters, 215 to 226 square feet), 11 twin deluxe cabins, (19 to 21 square meters, 205 to 226 square feet), 14 twin window cabins (12 to 14 square meters, 129 to 151 square feet) as well as 28 twin porthole cabins, two triple porthole cabins, and four quadruple porthole cabins that vary in size from 12 to 18 square meters, or 129 to 194 square feet. The passenger capacity certificate for Hondius is 196 persons. One deck consists of a large observation lounge and separate lecture room, which are reserved for a wide variety of interactive workshops, exhibitions, and performances particular to Hondius. Though elegantly designed in stylish mid-century modern décor, this vessel will have a cozy and informal atmosphere. Click here to view deck plan for MV Hondius. The Noorderlicht was originally built in 1910 in Flensburg, Germany as a three-masted schooner. In 1991 she was re-rigged and refitted thoroughly. The Noorderlicht now has 20 berths, and a well-balanced two-masted schooner rig capable of sailing the seven seas. The qualified captains have great experience of the oceans, and together with the rest of the crew, they will do everything possible to ensure that you have a wonderful and unforgettable adventure. The Noorderlicht has no ice class, but has a strengthened bow. Click here to view deck plan for S/V Noorderlicht. SV ‘Rembrandt Van Rijn’ was built as a herring lugger early last century. The vessel was rebuilt as a three-masted passenger sailing schooner in The Netherlands in 1994 and sailed in Spitsbergen (1994 – 1996) and in Galápagos (1998 - 2001). The vessel underwent a complete rebuilding and refurbishment program in 2011. The communication and navigation equipment has been completely renewed according to the latest SOLAS regulations. The Rembrandt van Rijn measures 56 metres in length (168 ft.), 7 metres in width and has a draft of 2.5metres. The maximum engine speed is 9 knots. She has an experienced crew of 10 on board including two tour guides. The ship can accommodate a maximum of 34 passengers in 17 twin cabins (1 Twin Shared cabin with porthole (shared shower and toilet), 6 Twin Private Inside cabins (with shower and toilet, no porthole), 10 Twin Private cabins (with shower and toilet and porthole). Click here to view deck plan for S/V ‘Rembrandt Van Rijn’. 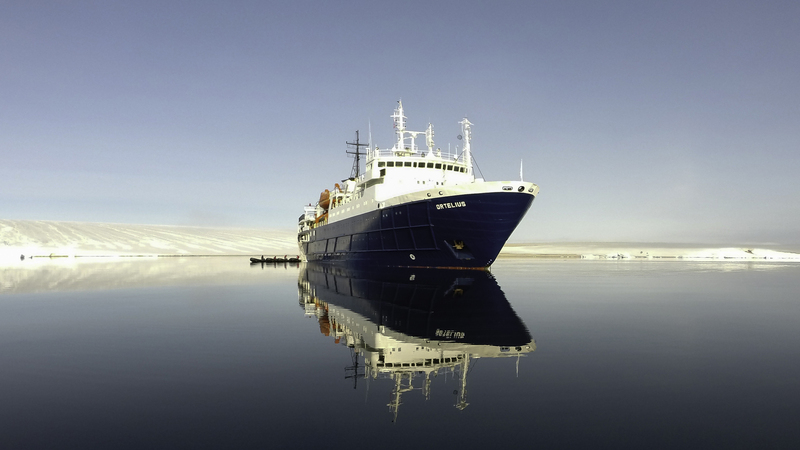 The Spirit of Enderby is a fully ice-strengthened expedition vessel, built in 1984 in Finland for polar and oceanographic research and is perfect for expedition cruising. She carries just 50 passengers. The ship is crewed by a very enthusiastic and most experienced Russian Captain and his crew. The expedition staff includes experienced naturalists and guides, who have devoted a lifetime to field research in the visited areas. Each expedition on the Spirit of Enderby is meticulously planned and led ensuring that passengers maximise every opportunity they have to learn and experience as much as possible about the region, while at the same time minimising environmental impact of their visit. Comfortable accommodation in twin or triple share cabins, approximately half of which have private facilities. Suites are available on higher decks. All cabins have outside windows or portholes and ample storage space. Ask your consultant regarding the deck plan and cabins for Spirit of Enderby. 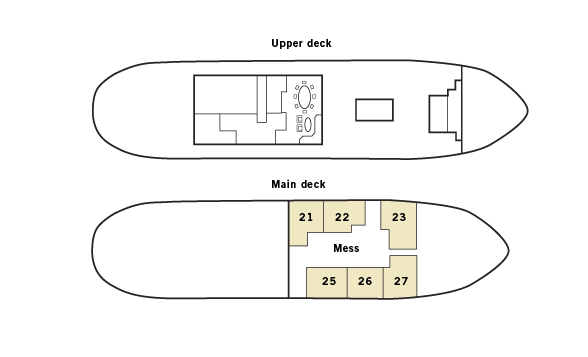 Click here to view deck plan for MS Stockholm. Sea Endurance: The ship was built in Denmark in 1992 to serve as a ferry on Greenland’s west coast. In 2004/2005 she was completely refurbished and now has a career as a small and comfortable expedition ship. Sea Endurance takes 53 passengers and all 26 cabins are outside cabins with private facilities. The triple cabins have upper and lower berths. All other cabins have two lower berths or a double bed. In your cabin you find a desk with a chair and a cupboard for storage. The superior cabins are spacious and have armchairs and TV/ DVD. The Owner’s cabin has a double bed, two large picture windows, a separate seating area and TV/DVD. In the dining room you are treated to delicious meals in between landings and in the panorama lounge you can enjoy breathtaking views of the surrounding landscape. Here you can listen to entertaining talks on the area’s flora, fauna and history. In the lounge you also find a bar and a small library. The ship has spacious observation decks, where you can enjoy the beautiful vistas. Passengers are welcome on the bridge around the clock and there is always something to see or search for. There is an international crew on board the Sea Endurance and the atmosphere is relaxed and very friendly. 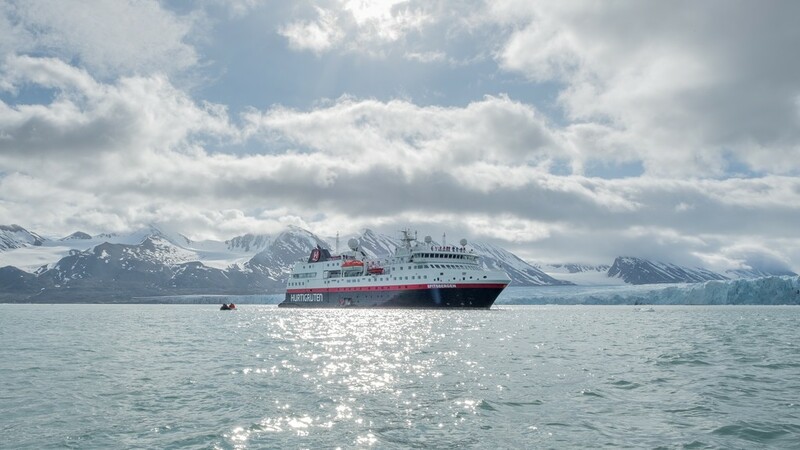 MS Nordstjernen (capacity 400 passengers) was built for the Coastal Voyage fleet in 1956 and extensively modernised in 2000 for exclusive Arctic sailing. Today she takes explorers on adventures in the waters around Spitsbergen. Despite modernisation, she still retains the aura of an old Atlantic ship, restored to her former splendour with new brass, classic wooden interiors and all her original art. Out on deck you come extra close to the untouched nature of the Polar Arctic and with roofs over a lot of the deck space you can enjoy being outside, even in rough weather. Hurtigruten's MS Fram was built in 2007 with one mission in mind - to bring her guests closer to nature, wildlife and unforgettable experiences. MS Fram is designed for sailing in polar waters, holds the highest safety standards and is the perfect size for optimum nautical manoeuvrability and guests’ comfort. With capacity for 276 passengers, the cabins are comfortable and spacious, with several categories to chose from. We recommend an outside cabin with a porthole or a window. A few cabins are adapted for guests with disabilities. The difference in price relates to the size of the cabin, on what deck level you are at and whether you opt to share or have a cabin on your own. Single supplement is available. Click here to view deck plan for MS Fram. Click here for the deck plan for MS Spitsbergen. Three resaurants: Aune Main Dining, Fredheim – the informal international meeting place, or the specialty restaurant Lindstrøm.